Bertram Husch, Thomas W. Beers, John A. Kershaw Jr. 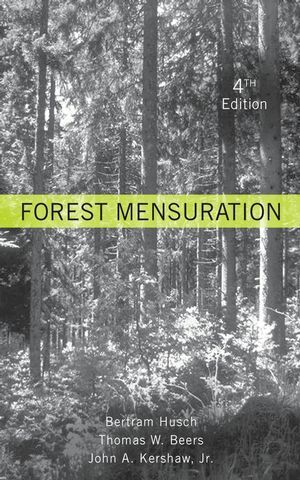 The updated edition of this long-standing classic, Forest Mensuration, Fourth Edition, provides new, complete coverage of current measurement practices and technological applications that expand the role of forest mensuration to include monitoring forest resources. This integrated approach takes into account all the resources of a forest, including such nontimber vegetation parameters as regeneration, lesser vegetation, woody detritus, and carbon. Forest Mensuration, Fourth Edition, is a valuable resource for students in forestry and forestry-related studies. BERTRAM HUSCH, PhD, is Forestry Consultant at INFORA Estudios Ltda. in Santiago, Chile, and former professor of forestry at the University of New Hampshire. THOMAS W. BEERS, PhD, is Professor Emeritus in the Department of Forestry and Natural Resources at Purdue University. JOHN A. KERSHAW, JR., PhD, is Professor of Forest Mensuration in the Faculty of Forestry and Environmental Management at the University of New Brunswick in Canada. 1-1. Role of Forest Mensuration in Forest Management. 1-2. Forest Mensuration as a Tool for Monitoring Forests. 2-5. Precision, Accuracy, and Bias. 2-6. Signi.cant Digits and Rounding O. 2-7. Data Summary and Presentation. 3-3. Measures of Central Tendency. 4-1. Land Distance and Area Units. 4-3. Measuring Area in the Field. 4-4. Measuring Area Using Maps and Photos. 4-5. Determination of Photo Scale. 4-6. Determination of Direction Using a Compass. 4-7. U.S. Public Land Surveys. 5-2. Tree Diameters and Areas. 6 Determination of Tree Volume. 6-1. Determination of Cubic Volume. 6-3. Construction of Volume Tables. 6-4. Volume Distribution in Trees. 7 Determination of Tree Weight. 7-1. Factors In.uencing Wood Weight Estimates. 9 Measurement of Primary Forest Products. 10 Nontimber Forest Vegetation Parameters. 10-3. Forest Vegetation for Wildlife Management. 11 Sampling Units for Estimating Parameters. 11-3. Sampling Units with Variable Probability. 11-5. Selecting Appropriate Sampling Units. 13 Sampling Designs in Forest Inventories. 13-3. Ratio and Regression Sampling. 13-9. Repeated Sampling in Forest Inventory. 14 Inventory Using Sampling with Varying Probability. 15 Growth of the Tree. 15-2. Height and Diameter Growth. 15-3. Determination of Diameter Growth from Increment Cores. 15-5. Areal and Volume Growth. 15-6. E.ects of Environmental Factors on Growth. 16 Stand Growth and Yield. 16-1. Elements of Stand Growth. 16-2. Growth and Yield Models. 16-3. Using Stand Growth and Yield Models. 16-4. Assessing Stand Growth and Yield in Forest Inventories.